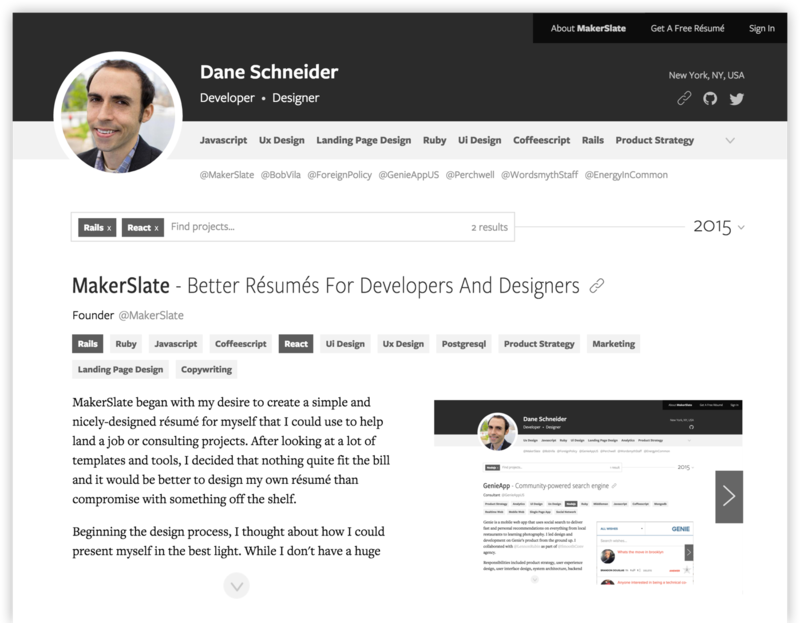 MakerSlate - A better résumé for developers and designers. A better résumé for developers and designers. Showcase your work, demonstrate your skills, and keep a nicely organized log of your projects. Already have a résumé? Sign in. ↓Click below to see it in action. “ Results stand out, and potential hires can really stand out by highlighting what they’ve done and the results. It’s so important to hire talent who can execute, and my focus as an employer is to determine if hires can theorize, strategize, and execute their plan. There are plenty of thinkers and not enough doers. Separate yourself from the masses, and demonstrate what you have done. but you can be first in line. MakerSlate launches in early December 2015. Sign up below to get notified. MakerSlate will never spam you, post anything automatically, or share your private data.